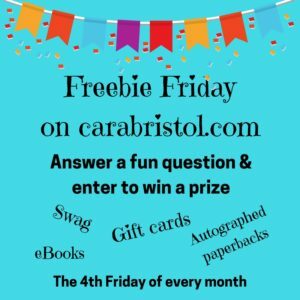 It’s Freebie Friday AND Black Friday, so I have a special prize drawing. A moon nightlight! In Hunted by the Cyborg (Cy-Ops Sci-fi Romance 6), several critical scenes occur on Earth’s moon, so I thought it would be fun to have a moon-centered giveaway. 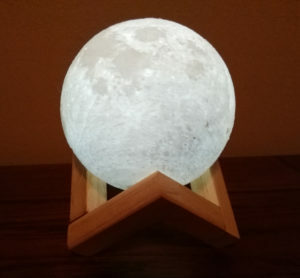 Plus, I bought one of these moon lights for myself, and I love it. It glows white or amber, and is about the size of a softball. 1. Answer the question posted below. Post your answer in the comments (answers posted on Facebook don’t qualify). 2. Be sure to leave an email address so I can contact you if you win. I do not save blog/drawing email addresses. 3. You have until Sunday evening, 6 p.m. US Central time, to enter the drawing. The winner will be selected by random draw and announced on Monday. 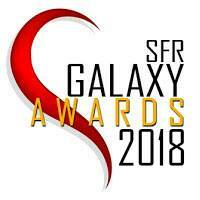 In the event that I cannot contact the winner or the winner does not claim the prize by Nov. 30 after being notified, I will choose another winner. 4. Read the Hunted by the Cyborg blurb to find out how you can get a FREE bonus story. Name something you associate with the moon. Preorder Hunted by the Cyborg and get a free BONUS story, Cyborg Attraction on release day, January 9. Hunted by the Cyborg is available now on Amazon. BN, iTunes, GooglePlay, and Kobo are coming soon. I’ll announce it in my reader newsletter when it’s ready on those sites. (Note: Cyborg Attraction will be in the back of Hunted by the Cyborg. After release day, a new file without the bonus story will be uploaded to vendor sites. Cyborg Attraction was previously titled Spark of the Attraction and was published in 2016 in Pets in Space 1, which is no longer available. The only way to get Cyborg Attraction is with Hunted by the Cyborg. 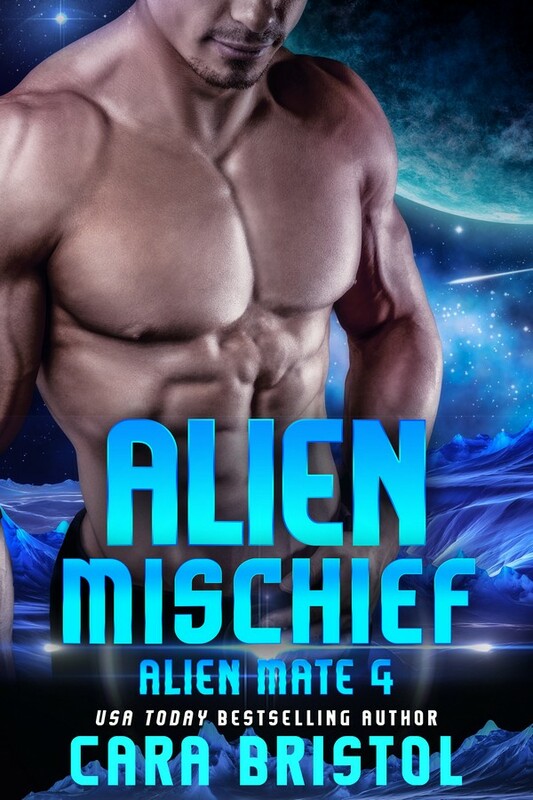 This entry was posted in Contests and tagged alien romance, aliens, Black Friday, clones, cloning, Cy-Ops Sci-fi Romance series, Cyborg Attraction, Earth's moon, Freebie Friday, get a bonus story, Hunted by the Cyborg, Luna, moon nightlight, Moonlight, prize giveaway, science fiction romance. Bookmark the permalink. When I was a child I always imagined that I could actually see the face of the man who lived in the moon. The man on the moon is classic. The moon is featured in a lot of songs. Great jaunty tune! Does make you want to dance. The brilliance of reflected light. Love the contrast of light and in a dark sky. A full moon is especially brilliant. And when there’s a “new moon” and no light, it is DARK. Aw. That’s a sad story. As a child, I had a “moon ball” similar to this one. It glowed in the dark and was my favorite toy. Sadly, it was lost in one of our many moves. I lost a few favored childhood possession, too. I hate that. Good luck with the drawing! Maybe you’ll be the lucky random winner. I think of that song too! It’s from the move Arthur. Romance and moonlight go together like chocolate and champagne! I think of the Credence Clearwater Revival song “Bad Moon Rising”. For some baffling reason I also think of the lagoon scene on the movie, ‘The Little Mermaid”, when Ariel and the Prince are on the boat at night and have their first kiss. Odd, huh? Who came up with that… The moon is made of cheese? Makes no sense and the moon doesn’t even look like it. Hi! My first thought is sitting outside as a kid, cuddling my German Shepherd, and staring at the moon and stars. Thanks for the giveaway! I love your stories. Oh so many things! As a kid I’d go outside and talk to the moon at night! (Ok maybe I still do when it’s full…) We lived in the country so not a lot of light pollution and the moon and stars were so bright! I taught one of my nieces to say ‘moon’ as one of her earliest words. One evening, she was about 3, she went running across a field outside my parents house. I asked where she was going. “To the moon!” Then there’s mythology – I often used Selene as an online username for virtual sites. I took intro to Astronomy under Harlan Smith who was a big proponent of lunar colonization. I attended some panels where he debated Sagan on Moon vs Mars for initial colonization. Actually attended a dinner with Smith and Sagan along with a dozen other students, a highlight for sure! One of those other students was the nephew of Michael Collins, the astronaut who stayed in orbit while Armstrong and Aldrin stepped on the moon for the first time. Oops, I was supposed to say one thing, I’ve rambled on too much! Wow, you ARE connected to the moon. Dancing by moonlight is so romantic. I do, too. I remember my mom waving at the moon during the moon landing. The song Moon River comes to mind. Plus I am teaching my 3 1/2 year old granddaughter about the moon. I love that song! Loved the movie Breakfast at Tiffany’s. I think of a clear, night sky with bright stars and a beautiful moon. Peaceful. It is peaceful, isn’t it? Childhood memories! I remember when I was ‘very young’, and my parents had a whole bunch of people over to the house and they said they were watching people land onthe moon. I ran outside and kept shouting, “I see them! I see them!”. 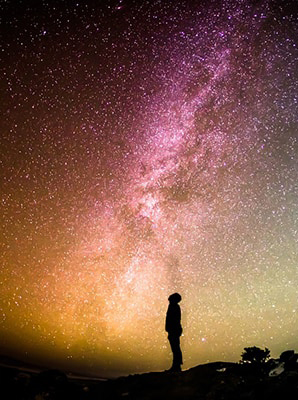 Now I’m just toally fascinated with space in general. But every time I look at the moon, I wonder what I was thinking that day. Moonstruck is the movie that immediately popped into my head as I read the question to answer for this special drawing. I loved the whole story and have watched the movie over 15 times, it never gets old. I even make eggs and bread like they did in the movie and call them Moonstruck eggs. Thank you for this opportunity, the moon lamp looks very cool. I never saw that movie. Was that the one with Cher? I thought of the song lyrics to “Spacebound” by Eminem because my hubby always would sing that song to me when we first got together! Going on 5+ years now! Beethoven’s Moonlight Sonata…or Billie Holliday’s What a Little Moonlight Can Do…. I love Beethoven’s Moonlight Sonata, although I find it a little melancholy. I remember watching the moonwalk when the astronauts walked on it and I was mesmerized. To think someone walked on the moon! And did you ever see a beautiful harvest moon? That’s a beautiful moon! I love this light and would love to have it! Yes, I’ve seen a Harvest moon. It’s amazing. I think of the song, “Moon River” which I sang a few years ago at a performance. In daylight it dies …. I think about camping in the desert with my family when I was younger. We would pack up the VW van and the weekend camping in the middle of the desert. It was beautiful during the day but at night it was gorgeous, the moon, the stars, the night blooming flowers, it was amazing. Yeah. I grew up in the desert. I love the desert smell. Yep. You must read a lot of paranormal? The moon is a constant in my life. In all the bad things I and my brothers went through as children and young adults it was always there changing on a schedule, shining at night to brighten our night. I’d sit and watch it on Indiana summer nights and daydream about going to outer space, living on the moon, wondering what the liens that lived there looked like. Many of my favorite movies are themed around the moon, The First Men in the Moon being my top favorite. Even now in my 60s I watch the moon and stars whenever I can, remembering back when I spent many a pleasant hour as a kid looking at that beautiful orb in the sky. I always been fascinated by the Moon. When I was child I use to think she was watching me and following all the time. Especially when I saw her when I was in my parents car. I felt sleepy, close my eyes for a second and she was still there. When the clouds hide her , I felt sad because I loose my friend. In fact , I though she was mine and the other child had their own. Especially when I told them that I could see a face on her but my friends saw nothing. It reminds me a little sparkle of magic from my childhood, when everything was possible , fly with the birds , touching the stars …even being friend with the moon ..
“Sparkle of magic.” I love that. Star and moon gazing on our farm as children. It brings back lots of great memories. Amazing how many people have fond memories of the moon from childhood. I love the moon. I always think of romantic walks when i see moonlight. It’s such a gentle, flattering light, too! I will always think of my grandmother when I hear someone refer to the moon or when I see the moon. She recently passed away. But during her stay in the hospital and nursing home every night she would ask I the moon was out, and to open the curtains to see it. She would be quite upset if she couldn’t. It was actually funny at the time (You had to know my grandmother’s personality). Any way, I now too look for that moon now that she’s gone because I know she has a front row seat to it every night. It’s the little things that become so important when you’re in the hospital. I work retail so I’m always thinking uh oh, what’s gonna happen this full moon! My stepdaughter works for the court system and she swears the crazies come out when there’s a full moon. I always think of men shredding their clothes as they turn into werewolves. It started with Lon Chaney Jr in the classic movie The Werewolf. The moon and werewolves are linked forever, I think.